When it comes to discussing magnetic shielding, a number of terms are tossed around that make sense to electrical engineers, which can be confusing to the rest of us. High Permeability, Medium Permeability, High Saturation, High Flux Density Magnetic Field, and Attenuation are words that I had to come to terms with as I learned the science behind magnetic shielding. Even with my vast technical background in electronics, I was an amateur when I first started working with magnetic shielding. Now, with 40 years of industry experience under my belt, I have developed some tips and tricks to better understand and teach the science behind magnetic shielding. As a nature lover, I look for analogies in the work around us to enable a better understanding of various electrical phenomena. For example, when I learned how magnetic fields work, I imagined the expanding rings on the surface of a pond caused by a single drop of water. Magnetic flux actually looks like this. It will dissipate with distance, but unlike a drop of water on a pond, it will not move constantly outward like the wave on the surface of the water. Instead, magnetic flux travels around and around as if a pellet were dropped into a circular rim that tipped it around, allowing it to continually return to its place of origin. 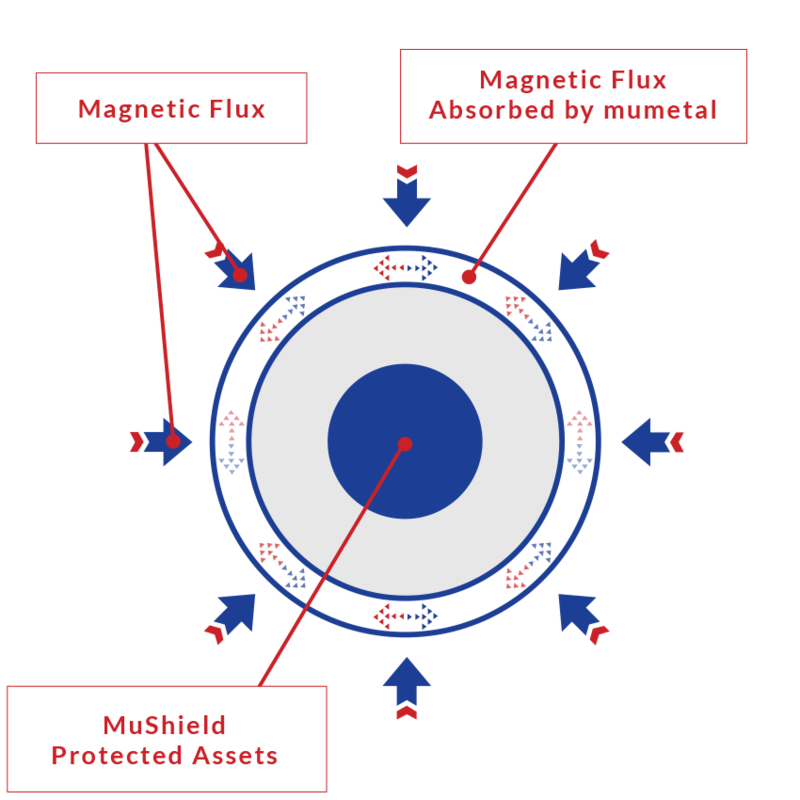 When a magnetic field encounters a high permeability magnetic shielding material such as mumetal or HyMu 80, the lines of flux are absorbed into the material like a sponge. A better analogy for this phenomenon is a beaver dam. When water hits a beaver dam, the water is keeping them safe and comfortable. 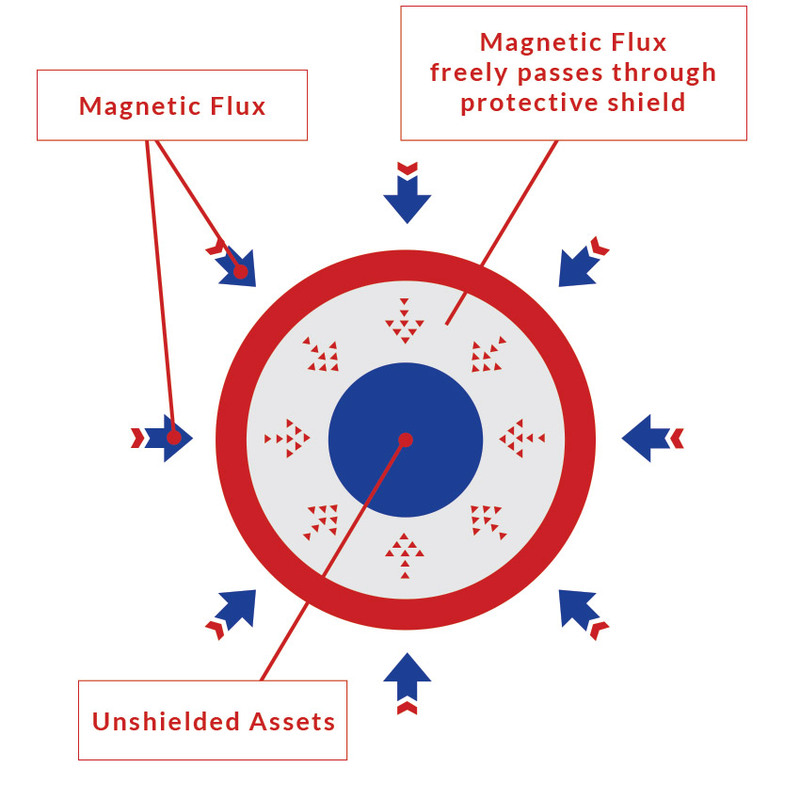 When we shield a sensitive instrument using mumetal magnetic shielding, the magnetic flux is absorbed and re-routed around the shield, keeping the instrument safe and operational. Now, if the high flux density field is too strong for the high permeability mumetal magnetic shield, the shield will saturate. In this scenario, we would use a two-stage design with an outside layer of medium permeability/high saturation 49% Nickel magnetic shielding material (depending on the magnetic field strength) to dilute the burst of dense magnetic interference. The second layer of high permeability mumetal magnetic shielding would absorb the residual magnetic flux. This double shield allows us to protect from sudden and dense magnetic fields, as well as shield from strong residual magnetic fields. Finally, when we succeed in shielding a component from magnetic interference, we have weakened the field to a measurable and desired degree. We call this the magnetic attenuation ratio. High attenuation (500X, 1000X, 2000X etc.) means lower magnetic interference (if any). Contact us today at info@mushield.com or 603-666-4433 if you think magnetic shielding is a fit for you.